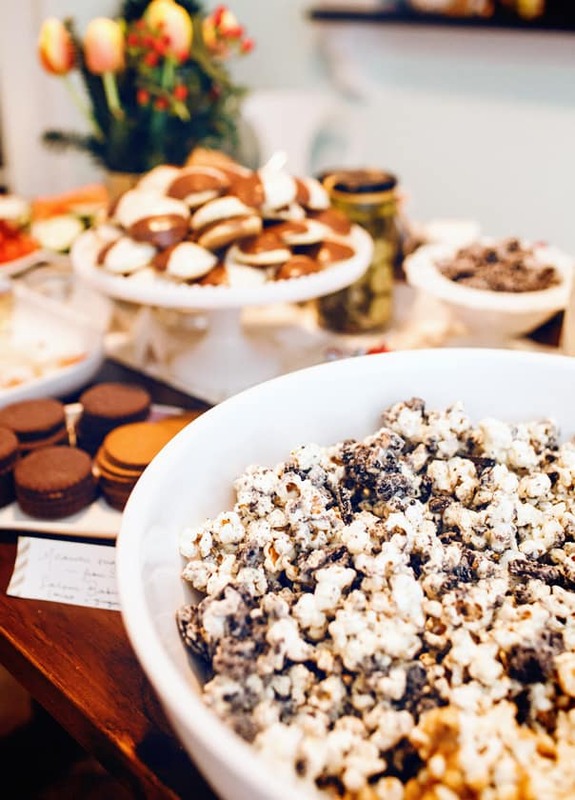 Thus, in planning the Bright Blog Bash, popcorn had to be included. 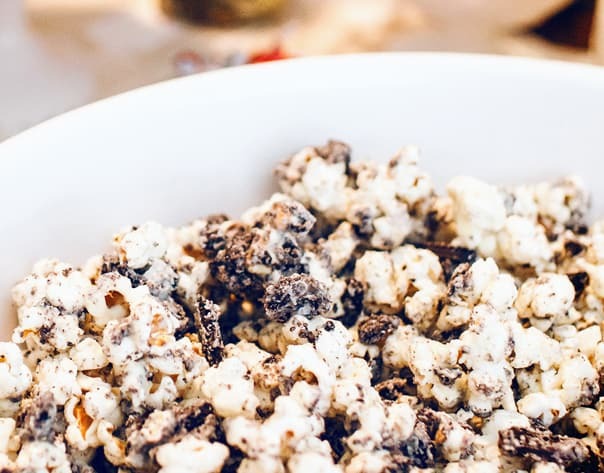 My friend Amy of Club Narwhal (one of those popcorn-loving friends) had told me about a dessert popcorn she makes with almond bark and Oreos, so I asked her for the recipe. Boy, is it amazing. 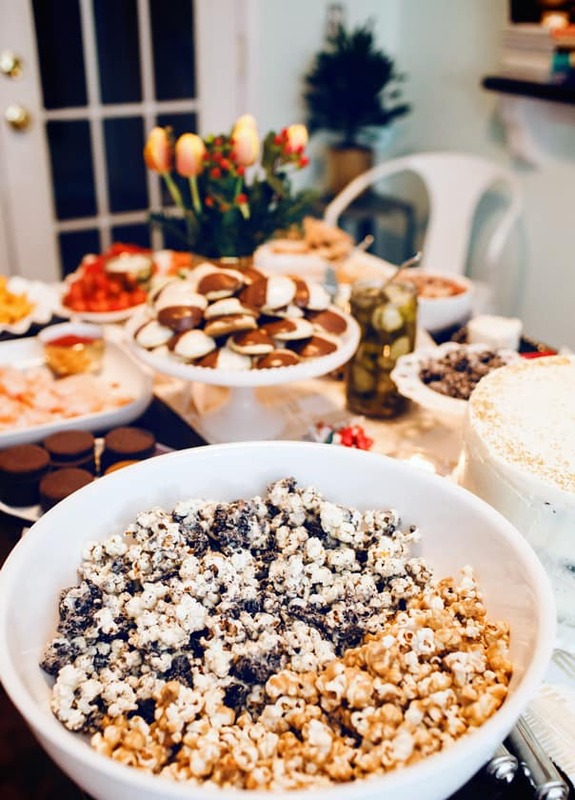 I elaborated on Amy’s recipe a bit and ended up with this amazing Cookies + Cream Popcorn, which I served alongside my Sea Salt Caramel Popcorn at the party. 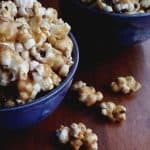 The two kinds of popcorn were a great combination of sweet and salty, soft and crunchy. They fit in nicely with the black and white and gold color scheme, too. P.S. Check out Katie’s post about her beautiful holiday decor on Twin Stripe today! 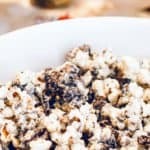 Click below to see the recipe for Cookies + Cream Popcorn! 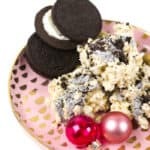 Make cookies + cream mixture. 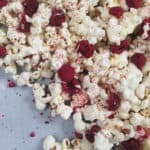 Line a baking sheet with parchment paper and spread the popcorn out in a single layer. In a glass, microwave-safe bowl, melt white chocolate chips for 20 seconds on 50% heat. Stir. Repeat until white chocolate is completely melted and smooth. Be careful not to overheat. While chocolate is heating, place cookies in a gallon zip-lock bag and smash them with a rolling pin until you have large broken chunks. 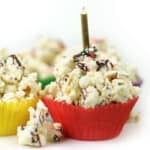 Spread cookie crumbles over the popcorn, then drizzle with the white chocolate. Gently stir to combine evenly. Sprinkle with sea salt. Let the popcorn cool on the pan. If desired, break apart any large clusters. Store in an airtight container for up to 2 weeks. Ok are you trying to make me the perfect snack? Because this is it. LOVE! Good grief, I cannot WAIT to try your version! 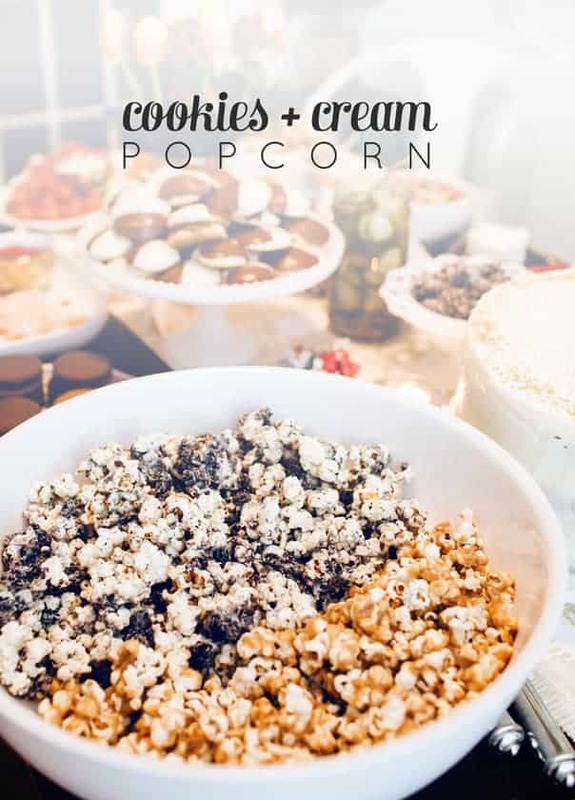 I’m just a little obsessed with popcorn and this one looks dreamy 🙂 So glad I could help! Woah this looks like heaven! Amazing idea! It was so so yummy! I’m all about cookies-n-cream…literally! And this popcorn is my favorite. yum!! I’m a popcorn addict too. This is a great combo of sweet and salty!